Aaron Villere is a graduate student working towards his Master’s in City Planning at BU Metropolitan College, with a focus transportation planning and public space. 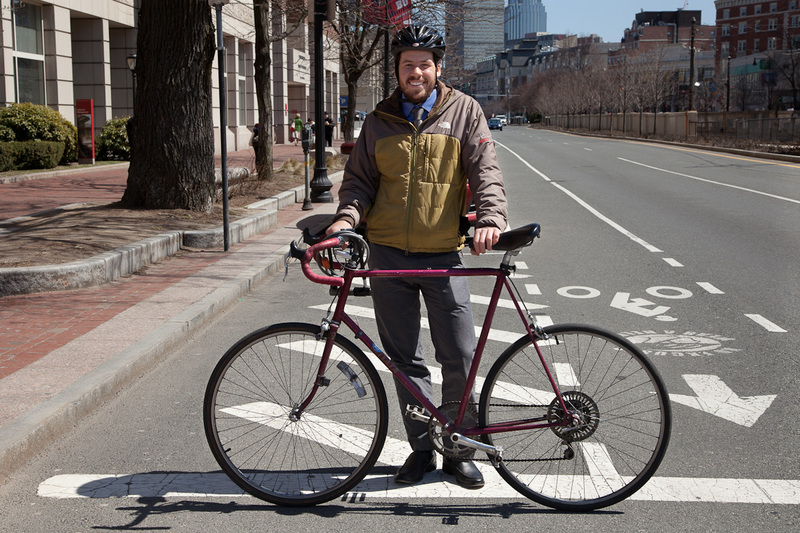 Aaron also works for the Boston Cyclists Union doing advocacy in Cambridge, and will be heading their Bike to Market program at the Union Square Farmers Market this summer. When moving to Cambridge in 2010, Aaron bought his Miyata 610 at Quad Bikes before even buying a mattress because he knew that’s exactly how he’d get around the city. His bike’s name is ‘BW’, but he won’t tell me what that stands for, only that ‘BW’ is male-identified. Intriguing. Aaron also identifies himself as a Cantabrigian, a term I don’t think I hear often enough. I would be remiss not to mention that Aaron writes his own blog over at The Flying Villere. He also plans to ride in the Boston Midnight Marathon Bike Ride this year. Ride on, Aaron!